Wash okra in running water then dry them completely with kitchen towel, remove top and tail. cut them as your choice. Heat oil in a pan add methi dana as they crackle add ginger, garlic and onion fry until brown. Add turmeric powder, red chili powder, coriander powder stir and mix it well, cook the spices for 2 minutes add okra and mix with spices. Lower the heat cover and cook until done. Open the lid add dry mango powder, karela masala powder and salt, mix completely, cook 2-3 minute more on high flame and switch of the gas. Add coriander and serve hot with paratha or poori. You can add lemon juice instead of dry mango powder. Use roasted fennel powder instead of karela masala powder. 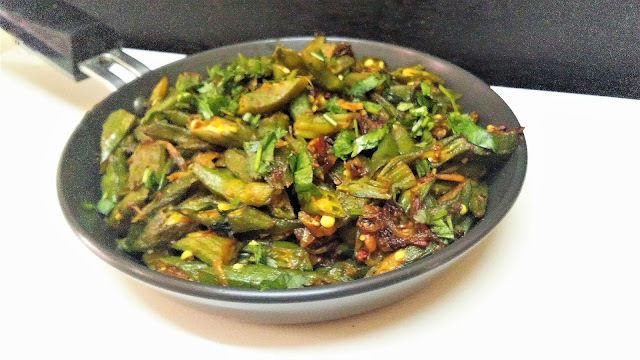 Do not over cook the Bhindi.